ISLAND OF MADEIRA - FUNCHAL - PORTO SANTO. 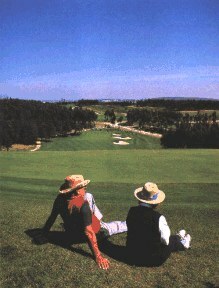 These pages are intended to promote the lesser known courses outside the Algarve area. Golfers can enjoy a round of golf on high quality courses, with excellent amenities, a reasonable handicap requirement and, at a time they wish to play. When playing these courses, you will see some of the most beautiful parts of the country and also encounter the warmth and friendliness of local people in their own communities. For suggested golf trips with accommodation within the area please visit the suggested golf trips page. Discounted golf rates are shown on the individual pages for each golf course and on the link above. They are only available for those making reservations prior to arrival. You can view all the golf courses by visiting our front page or go to the regional links for Northern Portugal, Lisbon and Central Portugal, Algarve, Island of Madeira and the courses in the Island of The Azores.